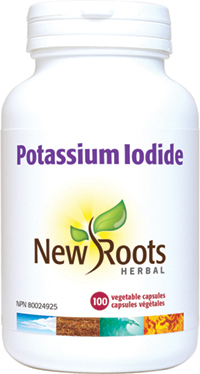 New Roots Herbal’s Potassium Iodide contains 800 µg of elemental iodine; this is the recommended daily allowance of iodine necessary to saturate and protect the thyroid gland during periods of potential exposure to radioactive iodine. Each capsule of New Roots Herbal’s Potassium Iodide contains 800 µg of elemental iodine, the recommended daily allowance according to Health Canada. Stable iodine prophylaxis (saturating the thyroid with iodine) is listed along with sheltering and evacuation as recommended emergency measures for protection from exposure to radioactive iodine. The thyroid gland requires iodine for hormone synthesis, and it absorbs all forms of iodine available; saturating the thyroid with a safe and stable form of iodine prevents the absorption radioactive iodine. The merits of iodine supplementation were shown following the Chernobyl nuclear disaster, with lower rate of thyroid cancer in Poland which had an iodine supplementation program in place as opposed to Russia, Ukraine, and Belarus.